Iggy's (1/2): Banged my car that day, the office secretary suggested I take the day off which seemed like an excellent idea. Invited husband out for lunch. I arrived early, so to quell hunger pangs and settle frazzled nerves, I ordered a Bloody Mary while waiting for husband to show up. Therefore could observe other clients walking in, an impressive list of prominent politicians, socialites and business people. Tried their burger, which is reputed to very good. I wouldn't know, it was so small I barely fitted in two bites, so how could I tell if it was any good? And it was served with potato wedges, WTF, burgers go with fries lah. Husband had better luck with his sakura ebi capellini; not sakura + ebi (aah the new menu lingo) but tiny pink shrimps which are of-the-sea sweet and cute, the pasta was tasty in a char mee-kia went west way. Was disappointed with the food this time, seemed so plain yet affected. Xin Jia Shang: Dinner with the makan gang, more details here. Cedele (1/8): Lunch with colleague. The staff turnover is very quick, I can lunch here everyday yet only recognise the lady who cleans the tables. Which may explain why simple orders take at least 15 minutes to process through. OK lah, forgive them because their breads are delicious. Ananda Bhavan's, near Mustafa: Did you know that Tena adult diapers are half the price at Mustafa's compared to Cold Storage? And then, because I haven't been shopping for some time and the domestics were telling me this and that are falling apart, we also hauled home shower curtains, floor mats, detergents, whiteboards and ironing board covers. All before 10.30 am which is the usual time we wake up Sunday mornings. So we deserved our paper thosais. Their coconut chutneys are pretty weak though, it is so hard to find decent thosais in Singapore. Blood Cafe (2/3): They've moved to the third floor. The couscous salad is good, so is the curry chicken sandwich. The iced mint drink, which the server is always keen to sell, is a bad idea unless one is addicted to the taste of toothpaste. A-Roy Thai (2/2): I finally got myself a Photoshop, but the economical Elements version. Now I can stick my blog name onto my images. Discovered their Fish steamed in Sour Cili sauce packs a lot of kick and zest in the steaming soup but I wish they would use a firmer fish than seabass. Took husband to try it, but he said Por Kee does a better version. Kaisan (1/4): Peter is the new sushi chef working with Thomas, he specialises in making pretty sushi, like fish slices braided and then dabbed with plum jam, and other embellishing styles that delight some people (me) and horrifies others (husband). Really, June is not the best time of the year for fish from Japan. Luckily there is this local fish called Sugi that makes an acceptable substitute, it's fine firm flesh is best shown to advantage simply grilled with mentaiko on top. Sin Swee Kee, Seah St. Their rice sets come with interesting side dishes. Oso: Husband read somewhere it is the best Italian in town. I wouldn't know because I have not eaten at many Italian restaurants. The first thing I said was, " Oh, wasn't this Salut before?". The man at the reception must have heard this so many times yet he was calm about it. The space is very crowded, I can hear the neighbours' conversations clearly, not something I mind very much because I am a kaypoh at heart. The banquette seats are also very confortable, for one thing, they don't sag when you sit on it, so you won't have a hunched back. So many good things even before we ordered. What I tried I liked tremendously example beef bresaola with its delicate smokiness interjected with grapefruit sections and drizzles of pesto. Husband suggested that I not order the Roast Cod in Balsamic because it sounded a little boring but I wanted to see how well they do boring, and to their credit, the cod came out flaky and tender inside and sensuously caramelised outside. Husband fared worse with his roast pork loin which was so dry that he had to return the dish after one bite. His substitute dish of gnocchi in gorgonzola sauce was better but bewilderingly, it was over-salted, I could literally feel the salt flakes crunch in my mouth. My good luck continued with dessert, chocolate tart had a pastry shell that 'snaps' and leaves a golden honey taste in mouth. Husband scored worse, again. He ordered the signature tiramisu which seemed a bit apologetic for its terribly subdued use of any of the essential ingredients like mascarpone, coffee liquer or sponge fingers. The service was exceptionally professional. An Italian man in a suit went round to every table to greet diners, it makes people feel important maybe but it seemed a little silly to me. They replaced husband's dish without any fuss. And the sommellier recommended a very nice red wine that husband was very taken with. Crystal Jade (2/12): Theme korean food. Also a weekday dinner to fortify myself with ginseng chicken soup. Spizza (1/5): The keys to the ladies washroom was missing, so we had to walk to the building's toilets. On way there I was distracted by the bustling activities at the Pudong Kitchen. We must eat there one day. Pu Tien, Kitchener Rd: Heng Hwa restaurant. Their char beehoon is less oily than their competitors. Rest of cooking mediocre but one can't tell from the lovely pictures taken with my new Casio Exilim camera, no? BTW, this camera has one major drawback, it has no date stamp. Bought it at Mustafa's which was selling it at $10 cheaper than what Funan could offer. Pontini's Copthorne Waterfront Hotel: It was a set lunch that was part of the meeting package, but the food was better than I expected, especially the lobster bisque rich with the taste of roasted lobster shells and lobster meat. Cafe George, le Meridien Hotel: This is our default place for confining groups of people to force-feed them industry knowledge. The meeting packages are reasonably priced and usually includes lunch buffet at the hotel cafe which serves a different menu every day. Day one, lovely duck liver pate to go with freshly baked bread. Day two, ox-tail braised in red wine, yum yums. Day three, crispy pratas sprinkled with sugar. The chicken porridge stall at FC at Blk 505, Jurong West St 51 (2/2): I vote this as the best chicken rice chicken in Singapore. Comes in a generous portion, requisitely tender, juicy and well seasoned. Good value too, a big plate of chicken drumstick is $4, while half the amount is usually sold by the likes of Wee Nam Kee for $6. Penang Place, IMM (2/4): First time, because husband came to pick me up from work (when car was out of commission). Second time, friend who lives in this part of the island invited me out for lunch. 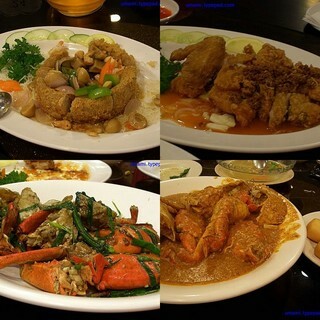 No signboard Restaurant, Esplanade (2/2): Their white pepper crab is super-shiok! The white pepper enhances the freshness of the crab, and the the dry sauce is light enough not to need any rice or bread to accompany it. This outlet serves mantou with their chilli-crab, I recall their Geylang place only serves the soft white coffeeshop bread. Was with colleagues one evening, but shy shy lah, so only ate one tiny mid-leg-section of crab. Took revenge the next day, husband and I went for lunch to whack one plate of cereal prawns, one plate white-pepper crab and one of chilli crab. Later, still had room for some overpriced cakes at V Tea Room. Shocking, no?